The Customize Captions dialog box allows you to configure how the caption fields in a project you're inserting are matched with the caption fields in your current project. You can associate caption fields from the project being inserted with caption fields in the current project, and decide whether the unmatched caption fields are added to your project or discarded. In your current project, in the Timeline view, move the timeline playhead over the scene after which you want the project to be inserted. Browse to and select the *.sboard or *.sbpz file of the project you want to select and click on Open. 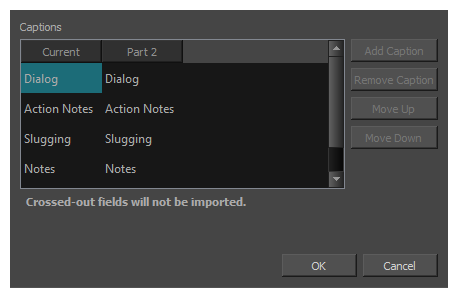 In the dialog prompting you to confirm how to manage the caption fields of the project being inserted, click on Customize. The list of captions being merged. The left column is for the caption fields in the current project, and the right column is for the caption fields in the project being inserted. If you have removed a caption from one of the project getting inserted, you can select the removed caption and click on this button to add it back. Ignores the currently selected caption field for the inserted project. The values for that caption field will not be imported in the current project.